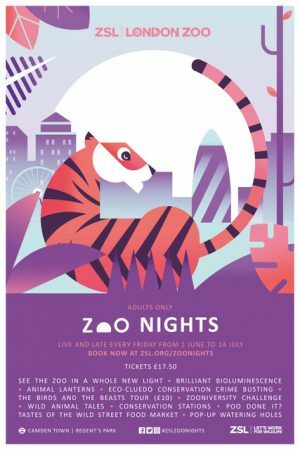 Manchester’s Edit_ brand studio and strategy consultant Claire Rigby have launched a campaign to promote London Zoo’s new adult-only nights. ‘Zoo Nights’ is a series of adult only, after hours events which will run throughout the summer and beyond. The brief was to develop an adult-focused proposition, which could be brought to life with a name and visual identity in order to extend the zoo’s appeal beyond families and daytime visits. Rigby explaineds “Given this year’s Summer events were targeting a young, urban and socially connected audience, we set out to re-frame and re-position the experience of a 'trip to the Zoo' in the minds of our target audience. “Our strategy was to not only communicate clearly and overtly the adults-only nature of these events, but to create a sustainable, long-term platform which ZSL London Zoo could extend and build upon as it continues to develop and grow it’s adult-only offering." Illustrated by Jane Bowyer and influenced by the style and language of festival posters, the campaign is designed to appeal to adults who are looking for a Friday night alternative in the city. Creative Director Karen Hughes said: “In order to feel relevant for the young, urban, professional we wanted to avoid being cute and cuddly, instead opting for a stylish, iconic set of illustrations. All animals were cleverly framed by the setting sun, creating a sense of atmosphere and ambience. Illustrator Bowyer added: "Could you get a more ideal brief that drawing animals for London Zoo? From an illustrator’s perspective, this project presented an interesting challenge — how to get each animal to harmoniously sit within the circle shape of the setting sun. “My approach was to start with the shape as a basis and build the animal form around it using a mixture of geometric and organic shapes." The campaign is currently being rolled out across London, with Out of home advertising across National Rail, the London Underground and throughout the city. Additional content is appearing across social media, in particular instagram and snapchat.